After completing a worldwide survey unprecedented in rigor and detail of astronomical sites for the Thirty Meter Telescope (TMT), the TMT Observatory Corporation board of directors has selected two outstanding sites, one in each hemisphere, for further consideration. Cerro Armazones lies in Chile's Atacama Desert, and Mauna Kea is on Hawai'i Island. The TMT observatory, which will be capable of peering back in space and time to the era when the first stars and galaxies were forming and will be able to directly image planets orbiting other stars, will herald a new generation of telescopes. To ensure that proposed TMT sites would provide the greatest advantage to the telescope's capabilities, a global satellite survey was conducted, from which a small sample of outstanding sites was chosen for further study using ground-based test equipment. This ground-based study of two sites in the northern hemisphere and three in the southern was the most comprehensive survey of its kind ever undertaken. Atmospheric turbulence above each candidate site, and wind characteristics, temperature variations, amount of water vapor, and other meteorological data at some of the candidate sites, were continuously monitored for up to four years. Based upon this campaign, the TMT project will now further evaluate the best site in the northern hemisphere and the best site in the southern hemisphere. "All five sites proved to be outstanding for carrying out astronomical observations," said Edward Stone, Caltech's Morrisroe Professor of Physics and vice chairman of the TMT board. 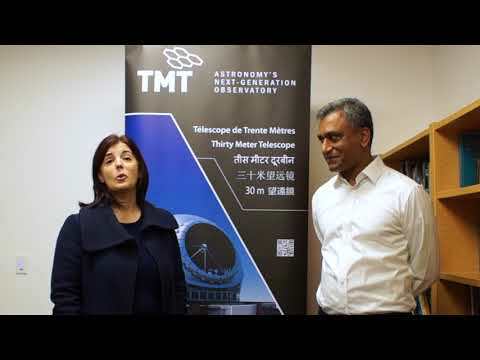 "I want to congratulate the TMT project team for conducting an excellent testing program, not only for TMT but for the benefit of astronomical research in the future." In addition to the "astronomical weather" at the sites, other considerations in the final selection will include the environment, accessibility, operations costs, and complementarities with other nearby astronomy facilities. The next step in the site analysis process is the preparation of an Environmental Impact Statement (EIS) that will thoroughly evaluate all aspects, including environmental, cultural, socio-economic, and financial, of constructing and operating the Thirty Meter Telescope in Hawai`i. An environmental impact statement for Cerro Armazones has already been completed and submitted to the Chilean government for their review. The community-based Mauna Kea Management Board, which oversees the management of the Mauna Kea summit in coordination with the University of Hawai'i at Hilo, concurs that the Thirty Meter Telescope should proceed with its EIS process. Regardless of whether Mauna Kea is selected as the Thirty Meter Telescope site, information generated from the EIS will be useful in the management of Mauna Kea. Henry Yang, TMT board chair and chancellor of UC Santa Barbara, expressed the gratitude of the board. "The selection of these top two candidate sites is an exciting milestone in the Thirty Meter Telescope's journey from vision to reality. We are grateful for the tireless efforts of our project team and the tremendous vision and support of the Moore Foundation and our international partners that have brought us to this point. We look forward to moving ahead rapidly and with all due diligence toward the selection of our preferred site." The TMT is currently in the final stages of an $80 million design phase. The plan is to initiate construction in 2010 with first light in early 2018. This project is a partnership between the University of California, California Institute of Technology, and ACURA, an organization of Canadian universities. The Gordon and Betty Moore Foundation has provided $50 million for the design phase of the project and has pledged an additional $200 million for the construction of the telescope, and Caltech and the University of California each will seek to raise matching funds of $50 million to bring the construction total to $300 million. "We look forward to the discussions with the people of Hawai'i and Chile regarding the opportunities to open a new era in astronomy in one of these two world capitals of astronomy," says Professor Ray Carlberg, the Canadian Large Optical Telescope project director and a TMT board member. "Canadian scientists have partnered in the extensive site testing carried out by TMT and we are very pleased to see that it has led to two great options for TMT."